Jul 13, 2009; 04:00 a.m. I straight away continue from where I left in my previous post. I have been tagged by this Questions Tag by both Shankar and Roshmi Sinha on Jul 2, 2009 and Jul 10, 2009 respectively. I have reordered the sequence of the questions a bit to offer some continuity. 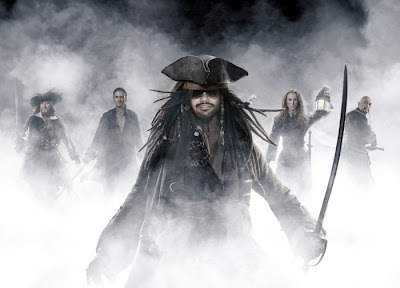 A: Well, as you can see, I replaced Johnny Depp in the forthcoming Pirates of Curry-bean IV. Its even more action-packed and has some great twists thanks to the new directing duo of Abbas-Mustan. I'll be killing Orlando Bloom in the movie and have some intimate scenes with Keira Knightley. So just fasten your seat belts. A: Just play this song. It goes best with this wallpaper and incidentally this is the song I last heard. A: In Chandigarh, though in a different house and in a different sector. Q: What’s your favourite town/city? A: My City Beautiful, Chandigarh of course. Do read my post Chandigarh Unabridged to know about some interesting facets of my city. A: Can't think of anyone particular among my acquaintances. A: Not sure. Moreover, why should anyone be! A: I am not sure if I ever did it in my life. Maybe long time back, for fun sake, I might have written few lines on a letter, my mother was posting to someone. A: No. But I recently replaced a punctured tyre. My mother was with me at that time. How proud she felt of her son, soon to turn 24, finally doing something manly enough. But the bigger revelation is that; for a week, my body ached big time. A: The following three; which I hope just end somehow. A: My own weight and the heat being generated by my laptop. A: As I just said, I am being burnt by my laptop right now. इस रोशन ज़माने में अँधेरी रात क्या थी! तनहाई में पुराने ज़ख्म फिर खोलता है! अंधेरे में उजाला खोजना भी दिल्लगी है! Don't worry, as I said, this was written long back, about 4 years ago. Read my post The Sophomore Days to know more about all this. A: Pursuing her higher studies. Q:When you looked at yourself in the mirror today, what was the first thing you thought? A: Now that the new day has already dawned (see the time stamp in the beginning), I just saw myself in mirror while applying mouth ulcer gel and pitied myself for having this painful malady attached to me since childhood. Once I had to be rushed to the Doctor's place and then to Emergency (just the chemist shop of Emergency) at the middle of the night to get some medicines as I had kept my bruised tongue hanging out of my mouth for too long and it had dried up like a piece of wood. A: Wallet is downstairs and I am in no mood to check it. As it is, whenever the cash goes down in my wallet, I get it instantly recharged from my dad's or mom's kitty. There's nothing to be ashamed of that, right? A: POUR. And well, light rain is just pouring outside. Monsoon is having a great time playing hide and seek with us. Q: What is your favourite ring tone on your phone? A: Well I just have a beep as I don't use the cell phone much. And on my landline phone, its the normal tring tring. A: Its Shashaank. By now my regular readers must be knowing him pretty well. A: A two-piece. I mean a collared striped-T and a khaki shorts. A: What does that mean? If it's anything to do with Brand-consciousness; then yes, when it comes to outdoors, I do go for good brands, not for the sake of their names but because of quality. However, at home local stuff is cool. Q: Name the brand of the shoes you currently own? A: Adidas and Reebok casuals, Lee Cooper formals and one more formals of some desi brand. A: Somewhere in between tending more towards brighter. However, when it comes to sleep, I prefer pitch darkness, something thats not possible these days as I go to bed around the same time as my mother leaves for her morning walk. A: Shankar and Roshmi! Two more crazy bloggers like me. Will take some more time to know them better. Great to have both amongst my Blogger Friends. A: Its a cool one, gifted by my sister and brother-in-law; the one with perpetual date technology. It has a large white dial and has a broad silver chain. Very elegant and 'manly'. So by changing the punctured tyre the other day, I proved my right to possess it. A: I am on my Blog usually at the midnight. Posted my previous tag post around that time. A: Now that's a long one from Airtel about some recharge offer. These are the messages I usually receive. A: No swearing words usually though in front of friends, especially college ones, I rant all my dirty vocabulary. A: My 'ex' ofcourse, in that case. And yeah, I am a bachelor (just a bachelor, not बीमार like Akshaye Khanna in his debut movie) and have not adopted any children. Q: Favourite age you have been so far? A: No particular. Life is fun all the way if we take it that way, each stage has something great to offer. Now that was an easy one! Hey, my mother just left for her morning walk. So time to go to bed. I'll be taking the last tag later in the day, hopefully. Jul 13, 2009; 08:15 p.m. Finally, this 5 things I love about myself tag is once again from Subhayan Wrahool Mukerjee (his previous one has been taken up as TAG-I in the previous post) as he tagged me twice on Jul 5, 2009. Empathy towards others. Theoretically, I've reached the saturation point but in practical terms there is a long way to go. Ability to impress others, especially the parents of my girl friends (including 'friends who are girls'). Most of them think that I am the most decent guy in the world and I let them live under this illusion. Creativity that reflects in most of the things I undertake. Confidence to undo some shortcomings. Despite my acute stammering problem at times, I did not hesitate to pick up the microphone at public gatherings. Thirst to lead from the front. I'll be posting my Rotaract (Club) experiences soon. To know how it all started in the college, read my post The Sophomore Days. Jul 13, 2009; 08:30 p.m.
With that I come to an end of all the tags. 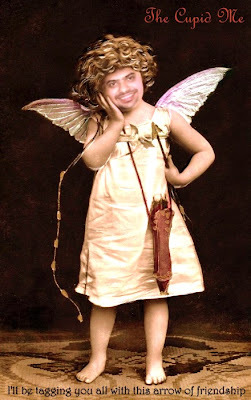 As you can see, The Cupid Me once again has decided to tag everyone who ends up reading this post. Here is my first tagged post. I wasn't tagged personally but it seems people fear tagging me personally or something. So Nicky, Cupid loves everyone and could not see your agony. Ability to impress ur girl friends parents??? even i did the same thing.... but no use.... both with her parents and later on failed to maintain my relationship with her.. I've seen a sense of modesty and subtle humor running all over your blog. When this is coupled with intelligence, everyone are attracted. That is the reason why everyone likes you. I believe you have plenty of friends. My deconstructionism says that you can attract more elderly people than young ones. All your tags are done humorously and intelligently :) Out of all 5 tags I am left with only two tags Tag I and Tag III looking forward to doing them soon !!! and more reason to bother u ... i have tagged thee again !!! As always had fun reading your post and tags are a good way to know more about others Mr. Manly!. don't u have an exam to prepare for!!!? I'll be more regular to ur blog!. I have just added you to my blog roll! The best way to be updated! @shashaank.. don't u have a start-up 2 tend to??? This must have been quite an "untagging day" for you...! I must say... the posts were entertaining... with imaginative answers, along with pics suiting the 'occasion'.